酒店的佈置很美，房間也很清潔，淋浴水壓很足夠，但是熱水不足。 只是早餐不好吃！ The layout of the hotel is beautiful, the rooms are very clean, shower pressure is sufficient, but lack of hot water. Just breakfast is not good! 四月初去武里南睇足球比賽, 住左一晚球會酒店, 亦響呢間酒店住左兩晚. 除左球會酒店, 最近武里南球場嘅就係呢間. 由球場搭的士去幾分鐘, 踩單車就一兩個字左右. 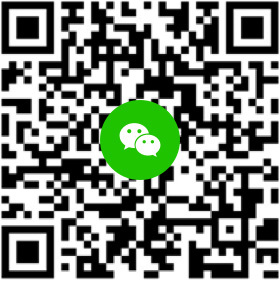 價錢比球會酒店平得多, 但房間企理 ok, 亦有泳池, 當時唔少足球記者/比賽職員都係住呢處. 我食野冇乜所謂, 所以早餐晚餐都 ok. 不設午餐, 但酒店門口就有餐廳. 老闆本來係銀行家, 為左接掌家族生意而轉行, 所以佢好 open-minded, 有問我意見, 亦有心將酒店做得更好. 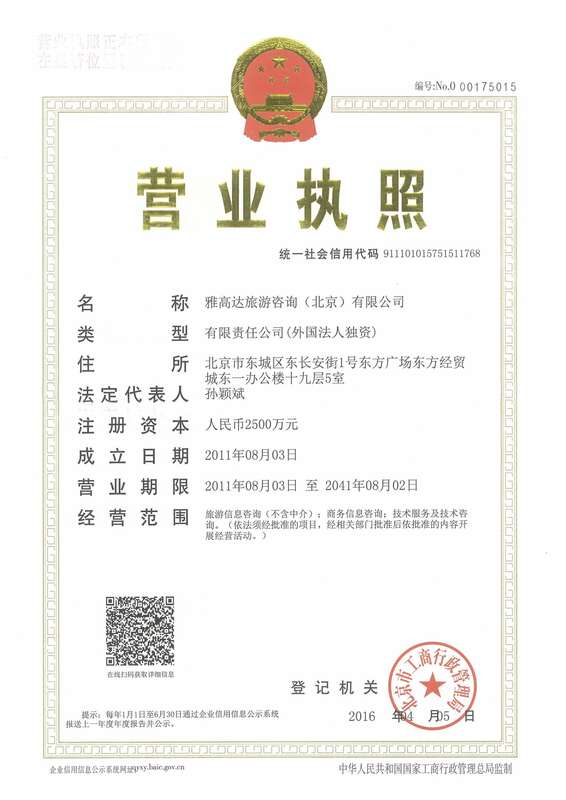 整體設施當然唔及新開嘅球會酒店, 但球會酒店房間唔算多容易滿(尤其是比賽日), 亦較貴, 所以呢間亦都係唔錯嘅選擇. Good service. Polite staff. Awesome breakfast... Despite language barrier.. some staffs not fluent in english.. they immediately ask their english speaking friends to accomodate us. Before flying i emailed with them to confirm and all... replied politely and our stay was awesome. Quiet place for relaxing... To note the room floor is super clean.. Thank you will stay again when i go there..
We stayed for 6 nights at the Thada Chateau Hotel. The rooms are nice, big and very clean (cleaning ladies doing a great job). The swimming-pool is fantastic and its surroundings beautiful: our kids loved it (so did we). Most of the employees don't speak English but the manager who is available during day time speaks English and is always happy to help (really nice person). At night, a young employee named Stone (also very nice) speaks English. The situation of the hotel is not great though : a bit far from town and along a big road (6 lanes). But you can't hear the cars from the rooms. Walking to town was impossible ( works on the road), so if you want to eat in a good restaurant, you will need to get a Tuk Tuk or a taxi (cheap : 80/100 Baths = 2€/2€50) as the restaurant on the hotel grounds is terrible. 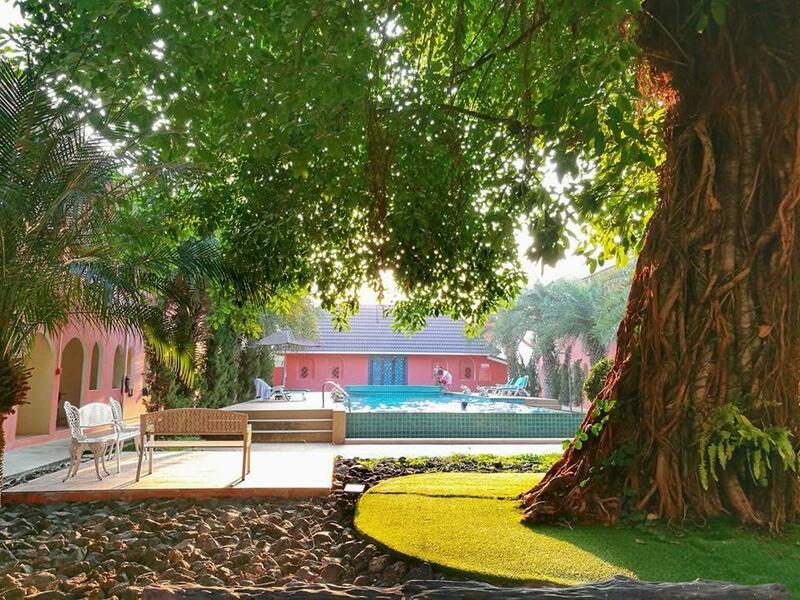 So, if you want a really nice hotel with a great swimming-pool and friendly staff and you don't mind using taxis and Tuk Tuks for luch and dinner, this is the place for you! This is a very nice large spot real estate that is a hybrid between a farm and a nice hotel which is a really nice touch. as others have indicated, there's no elevator so worst case it is 2 floors to climb if you care not to spend a little more for larger rooms. Your choice. There aren't so many transportation options if you dont have a car or motorbike so expect rip off quotes from local taxi drivers. Not a hotel problem but they might want to consider renting scooters to round out their offerings and get more business. 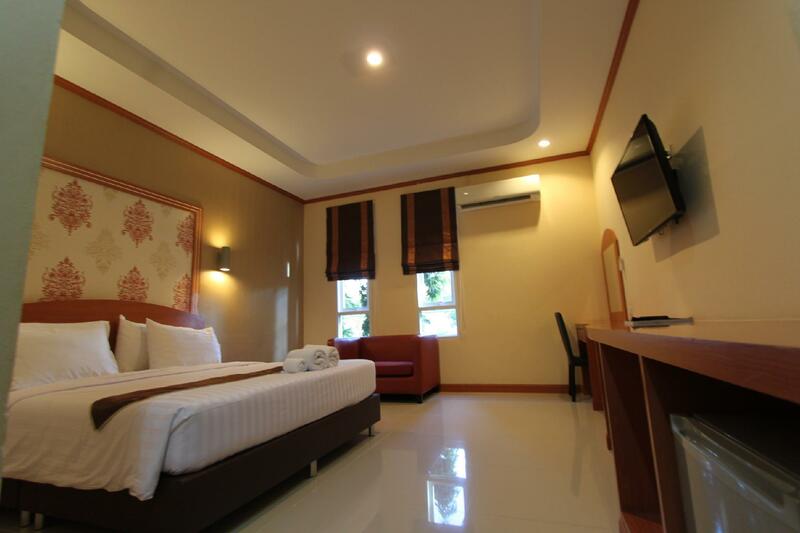 Rooms are clean, nice LCD TV (only one English channel but many many Thai channels). Pool is fantastic. Reception have fridge of liquids(water, beer) and they sell other toiletry essentials. Staff went out of their way to help us on last day to get transportation. Sheep come out for feeding on pasture around 930am each day. There is a nice restaurant for ordering room service, up to 830pm (their sign says 9pm but this is Thailand). Just next to that is a music bar restaurant. Thai only menu. But excellent service and music goes thru the wee hours. Don't have to go far for entertainment! It's not far from I-mobile stadium just around 2 km. Room is clean and free mini bar. It has goat farm & nice swimming pool. Recommended breakfast, although not much varieties but it's delicious. Overall, worth the money. We came to Buriram for a football weekend and Thada Château is very handy for Thunder Castle. The hotel is small but it's attractive having been built in a European style, including a windmill. The pool in the photo has an adult section and a children's section and that is convenient. Our room was a family suite and that was a good size with bedroom, living room and shower room. A pleasant surprise was the free of charge mini bar items! Crisps, cake and nuts as well as water. The restaurant was small and very busy at the time we arrived for breakfast but we quickly got a seat and as the early risers left there were far fewer people there. A waiter saw me waiting for the omelette chef and tried to prepare my eggs for me. When the chef arrived, she saw what he'd done and threw it away!! Then she made me the best scrambled eggs I have ever had: fresh and light ... perfectly cooked. That was another pleasant surprise. The food on offer got a 7.5 out of 10 for variety: I needed a little bit more variety in the cereals and bread. I would happily stay here again. When I had a flats tire the manager went the extra mile to locate and call a mechanic to come fix it, even though we were already checked out. The breakfast lady was very attentive and friendly, without being over bearing. Our only real complaint was the useless window curtain in the room that let in bright light at night and was completely ineffectual during the day as well. We overnighted here on the way from Rayong to Mukdahan, and arrived relatively late. Although when we arrived we realised the bed arrangement wasn’t going to work for all of us it was quickly and helpfully resolved, despite the time. The kids were happy that the WiFi was decent, and need3d to be with six of us logged on at the same time, Next morning, we all found breakfast options we liked from the buffet and hot food counter complimentary withe the room. The Kai grata (eggs cooked, and served in a pan, with sausage) was amazing. Never tried before, but three helpings set me up for the next day’s drive very well. Again, the staff couldn’t have been more helpful in finding me a bucket of water to wash away the insect carnage on the windscreen resulting from driving the previous evening, and our youngest daughter really enjoyed visiting the sheep, ponies (and cats) on the little farm set up. It’s a pity we didn’t have time to enjoy the pool, which looked very tranquil and lush. The hotel is located a bit outside of town and you need to get a taxi into the city centre (about 150 Baht - it seems the taxi have a fix rate :-)).The hotel is quiet and has a relaxing feeling. The communal area is kept simple with a few wooden chairs/benches in a patio and surrounded by trees. A nice pool with a few deckchairs. A few rooms on the ground have an outdoor sitting area. 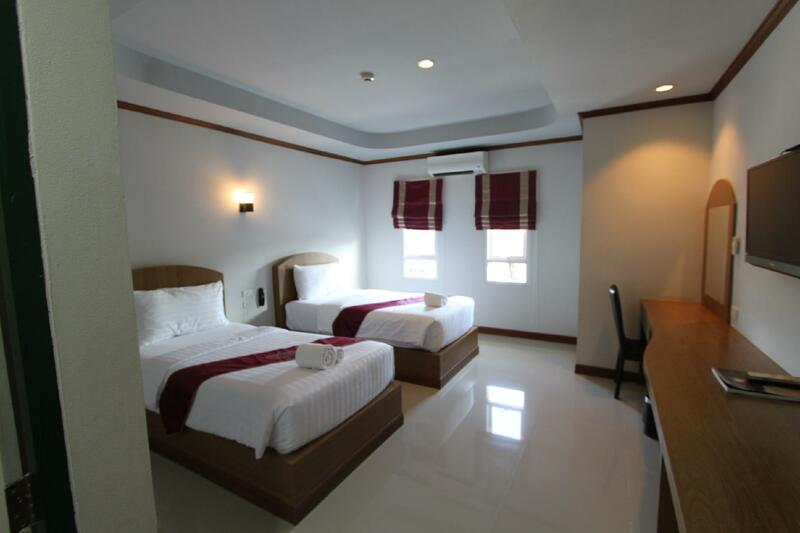 The room itself (we were on the 3rd floor) are clean and have comfy beds, fridge, AC and TV. Our room was a bit strangly concepted as we couldn't get into the shower when the bathroom door was open. To stand by the sink we had to close the door. 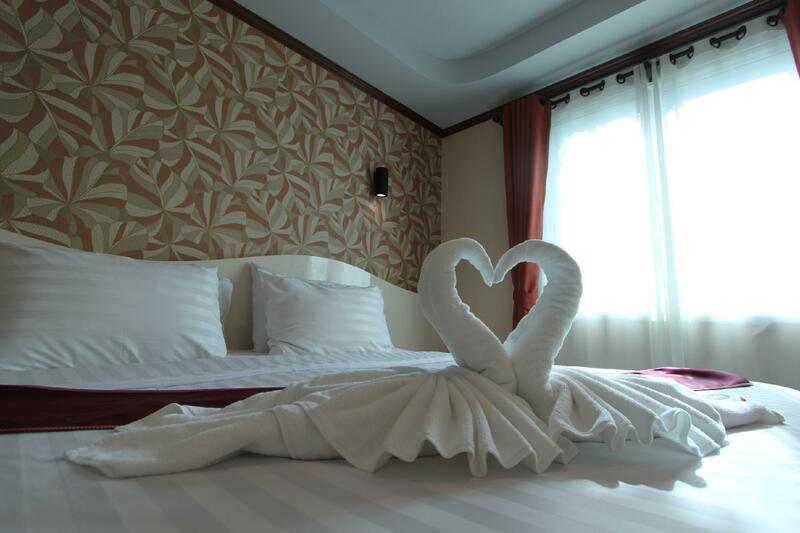 There is a daily cleaning service and towels are changed every day. The breakfast was ok. There is a cooking station where you can get your eggs cooked or Thai soup after your "gusto". A small variation of fruit, cereals, bred and 2 hot meals - mostly Thai stirfry. Coffee/tea and juice are also available. Staff is friendly and helpful but not everybody speaks E.
For all you rev heads out there that are travelling for the international racing events in Buriram this ones just down the road from the track. A real nice place and if you hire a car from Peter at Buriram car hire then your set to see the lovely Buriram province. 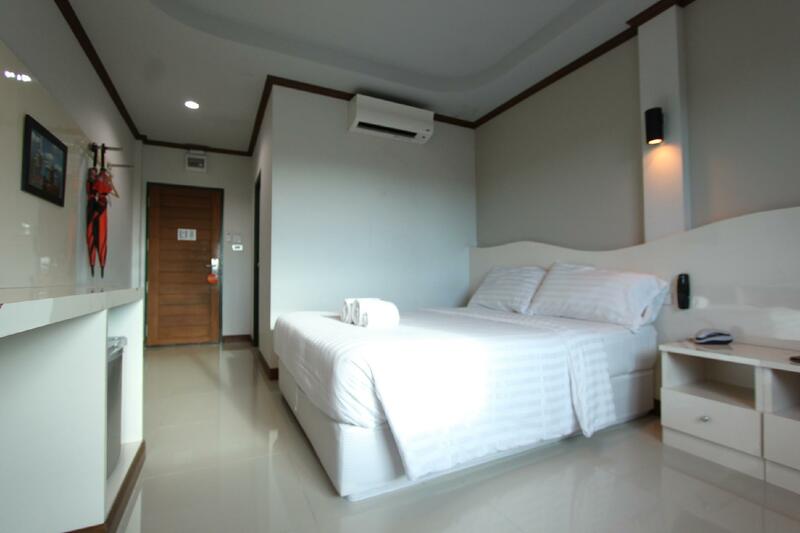 I must write this review comparing our previous 3 trips to hotels in Buriram. This was the most expensive hotel out of 6 others we have stayed in the city. The swimming pool was the best of all and that's where it ends. Checking in was no problem, but there was no bell boy and I needed to unload and carry 6 bags myself in the afternoon heat. Room was OK and I presume the front porch was the designer's idea of a patio or balcony as there there were only 2 long windows looking out at an untidy garden patch and a lot of rubbish was the only view. The bathroom was far too small and not enough light. Bed was fine. Breakfast was adequate but we normally have better in the other Buriram 3 star hotels.The place just has no ambiance, atmosphere or signs of quality --- anywhere. 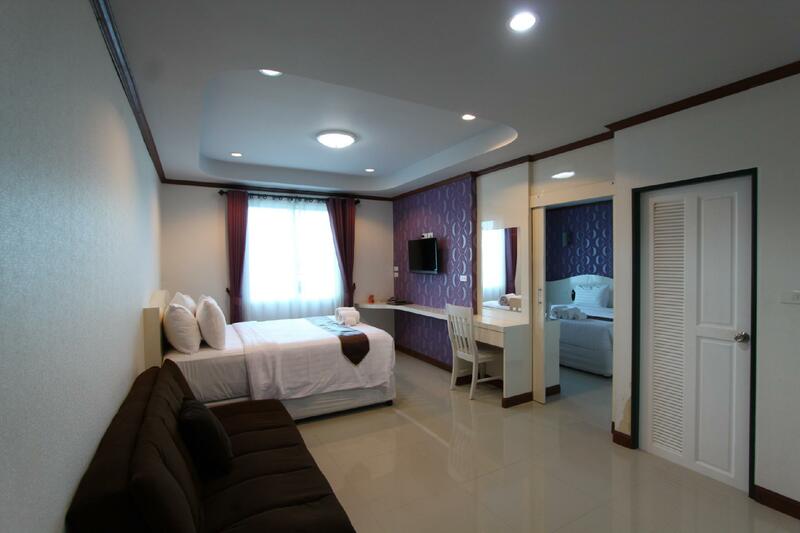 The only saving grace was I only paid the discount price from Agoda and NOT the walk-in price of 2,400 thb. The Internet was totally useless in the rooms and only available near to reception. Worst connection of anywhere we've stayed before or since. The manager did apologize in perfect English when the power went off in the city so we had to check-out one hour early. We will not return -- at any price. Small hotel not far from the stadium, liked the design, room was clean and basic. Hot shower worked , air, 2 bottles of water, safe, no wardrobe but hanging space. No lift and no one offered to help carry the bags up. Nice pool and you can feed the sheep there too. Small café as you come in which has food all day. Buffet style breakfast was good. No issues parking.